The Liberal National Government has announced traffic signal enhancements to be installed at more than 40 Perth intersections. 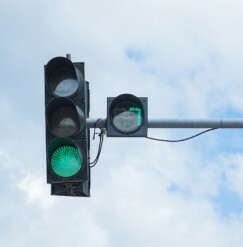 Transport Minister Bill Marmion said successful trials involving traffic signal enhancements had been conducted as part of Main Roads Western Australia’s Traffic Congestion Management Program (TCMP). “The trials included pedestrian countdown timers, flashing yellow ‘caution’ lights for turning traffic and right-turn filtering,” Mr Marmion said. “Countdown timers replace the ‘flashing red man’ at traffic signals and let pedestrians know exactly how many seconds are left to cross the road. Timers are currently operational in 17 Perth locations, with 23 further intersections confirmed for timer installation. “A key objective of the State Government’s TCMP is to make the most out of existing infrastructure – modifications to traffic signals can improve pedestrian safety and traffic flow at relatively small cost,” the Minister said. Installation of the additional countdown timers, flashing yellow ‘caution’ lights and right-turn filtering is expected to be completed by June 2017.